One of the hardest things about divorce if you’re a parent is having to now split custody of your kids with your ex. I used to be a stay-at-home mother–a conscious decision that was made by both of us for the well-being of our children. Then, with the break-up of our marriage, I found myself forced to co-create a schedule that included our children splitting their time between their dad and me. It was devastating. Co-parenting? Ugh–I was still reeling from being suddenly single after 17 years of marriage. Being with my kids 24/7 was not only a major part of my identity and really, career as a person, but it also touched on the earlier loss of losing my mother when I was seven. Part of working through this time of my life successfully included acknowledging the feelings coming up, and using the time to create a good life for myself and my children. With the help of a good therapist I worked through this latest experience of loss. I went back to school, became a Reiki master, got a life coaching certificate, trained for a half marathon and 5k races, spent time with friends and family, and did things that enhanced my life. I even joined a divorce support group. During this time, I wasn’t the only one going through a major transition–our kids did, too. Grown-ups deal with all kinds of issues when going through the painful process of divorce. Sometimes when you’re in the midst of a traumatic experience, it is hard to get a handle on your life–let alone someone else’s. We also have to look out for our kids, too. One thing I’ve observed with children and teens whose parents are divorced is that when it is time to leave your house and go to your ex’s house, kids can get a little cranky, moody, or they can become withdrawn. Their behaviors and attitudes change. Transitions–going from your house to your ex’s and back again–can be hard on children. You also may notice that your kids might be a little more quiet or more talkative in the beginning of the visit. Or, they’ll be more moody. 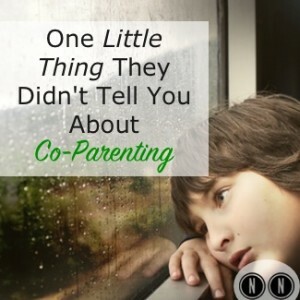 These are signs that they are transitioning in their own way from one parent to another. They may lack the skills to verbalize their thoughts and feelings so they are using the only tools they have to deal with what’s going on for them. If the two parents are drastically different, you may see more of this behavior than if the parents are similar. What I’ve seen with kids who are affected by Parental Alienation is they become argumentative (or even more so)–especially on the day they leave. It is almost as if unconsciously they want to leave and be able to say to the other (alienating) parent–as an unhealthy way of bonding–“Yes, they’re horrible! Listen to this…” or whatever negative spin they can put on it. Their attitude on the last day or last few hours can be bordering on what you see in kids who have Oppositional Defiant Disorder. I also think that these very real and normal feelings can be distorted by parents who have an ulterior motive–to turn the child against their other parent. “Oh, sweetie, what’s wrong? Why are you so upset? What happened over there?” They plant seeds in their child’s mind that something is not okay over at the other parent’s house. What can you do if you notice your child(ren) are moody, cranky, or become withdrawn when it comes time to leave your home? Realize you have a choice as to how you react as a parent. Be empathetic to what they are going through (you might be feeling sad or angry, too, about them leaving). Help them label the feelings they are having. Listen to them if they have something to say. Be solution-focused, not problem-focused. Divorce is hard on them no doubt, but instead of staying stuck on the problem, focus on solutions. Get them involved with this–ask for their input (this should not involve them dictating to you how they’re going to change the custody schedule–that’s too much power for a kid). As a parent, model for them how to be steady and non-reactive to whatever it is going on for them when they’re feeling angry. It’s okay to have these feelings, it is NOT okay to act them out. That goes for you, too. Consider having rituals when they first come to your home and when they leave. Maybe they bake on the day they get to your home, and it’s a more formal family dinner where they help cook a dish on the night they leave. Divorce isn’t easy–especially on kids. Many times, the parents are well on their way to healing, when you’ll start to notice that the children begin to react to the divorce. At their age, they lack the tools to process the anger, sadness, loss, and other feelings associated with this huge life-changing event. You or a counselor can help them with this. When they begin to act out at the beginning, but especially the end of your visit, take time to consciously and compassionately respond to them. Have you noticed this pattern with your child(ren)? What kinds of things help them get through the transitions?